Leslie Model 430 | MOSweb Online! This model is a 2 way speaker system for audiophiles, and comes with two cabinets like the one shown. The system is basically a high quality stereo speaker cabinet with a slow speed rotor on the woofer. In addition there is a “Space Generator” on the midrange and treble. 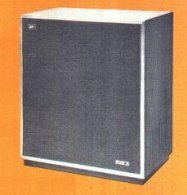 Collectively the 430 / 450 / 470 cabinets are known as the “Plus2 system”. Interface Phone / Phono ?